Who would have ever imagined that a tiny island, only 65 meters at its highest point, is closer to heaven than all peaks of the world piled together? During the early spring of 2005, my lovely wife and I planned a trip to Anguilla with much excitement and anticipation. Due to an unfortunate situation, Kristen was unable to go. I went to Anguilla alone expecting to have a boring vacation. I did not know what I was in store for. I often tell Kristen about Anguilla and its wonders, but life circumstances have prevented us from planning a second trip. Thus, this is a great opportunity to let my imagination free and express my dreams of a day in Anguilla with the love of my life. It was 7:15 in the morning and I could no longer remain in bed. As I opened the doors to my veranda, I realized that it was a cloudy morning. The clouds were thick and there didn't seem to be one single opening in the sky. Despite my initial disappointment, I decided to sit on the comfortable veranda chair and enjoy a warm cup of coffee. The air was nicely moist and the rain was a gentle drizzle that brought out the distinctive aroma of the Caribbean brush. As I gazed at the beach, I was surprised of how blue the ocean looked despite the gloomy skies and I thought to myself only Anguilla can do this. Only a few minutes went by when I saw that Honey was up. She was standing at the threshold of the door looking at the beach. From her expression, I could tell that she was trying to absorb all the beauty in front of her at once. She sighed and sat right next to me. After having a light, delicious breakfast at the resort's patio restaurant, we heard the birds chirping happily as if wanting to announce something. Indeed they were, we looked at the sky and the clouds were giving way to a splendorous bright blue sky. 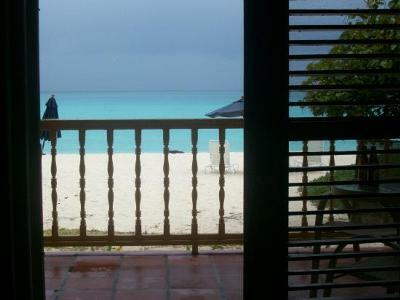 I remembered that one of the great things about Anguilla is that generally it rains only for short periods of time. Yes, it was beach time! As we came out of our beach bungalow, there it was. Rendezvous was as pristine and stunningly beautiful as I remembered to be. We did not hesitate for a second to lay our towels on the beach lounges and enjoy. The sky was still clearing and there was a bold Anguilla rainbow. For some reason, the first time I was in Anguilla I also saw a rainbow everyday. At that time of the day, the beach was simply gorgeous. The water was perfectly clear, electric blue and the waves were gentle. As I turned to Kristen, she was beaming with excitement. Not much longer after that, we couldn't resist the urge and decided to give ourselves up to the arms of the sea. We concluded that this was the most beautiful beach we had ever laid eyes on. After some time passed, the warmth of the sun told us that it was time to open the first Carib, so I dug a couple out of our bungalow and we consummated our Caribbean experience. Bright sun, soft white sand, clear cerulean water and Kristen beside me enjoying a cold Carib. We didn't need anything else. Life was good. Kristen was reading a book and intermittently looking at the ocean. I tried to do the same, but couldn't pay much attention to my book. The ocean was too mesmerizing and it kept calling my name, so I finally decided to grab a kayak and cruise around. As I was paddling and enjoying the panoramic view of nearby St. Martin, I saw a shadow in the corner of my eye that startled me. It was a sting ray! He was peacefully swimming totally unfazed by my kayak. I smiled and just observed as he swam away. In a Zen-like state of relaxation, Kristen and I wished that we could laze the day away on Rendezvous. We were getting hungry again and there was so much more to see. After all, we only had a day left in Anguilla and we wanted to make the most out of it. So, we got in our rental car and drove away trying our best to stay on the left side of the road. Needless to say, this took some concentration, but it was an adventure. As we headed toward The Valley, we passed some villages with traditional Caribbean houses that were very quaint and colorful. Many people waved as we drove by. How nice people are in this beautiful island. People do not regularly do that where we come from. We saw many goats and the Road Salt Pond on the way. Since we were pretty hungry, we wanted something good and quick, so we decided to stop at a famous BBQ places on the side of the road. Both my wife and I had the BBQ ribs and we ate them clean. The meat was ultra tender and it had a delightful charbroiled taste that we both love. The service was kind and quick. People here are just so nice. Being originally from Mexico, I've had my share of street foods, and this was especially good. After having our tasty BBQ lunch, we drove through The Valley and kept heading east toward Shoal Bay. At the end of the road, we found Gwen's Reggae Bar & Grill. Kristen and I love beach bars; especially if they have hammocks! Before crashing on Gwen's hammocks, we decided to treat ourselves a couple of rum punches to help our digestion. They were good and deliciously strong. We found the perfect hammock close to the beach and decided to relax for a little while. We were not intending to fall asleep, but the soothing sound of the waves, the Caribbean music in the background and my honey's hand gently scratching my head put us both to sleep in a matter of minutes. When we woke up, we both agreed on how wonderful life's simple things can be in this sleepy little island. I finally decided to get active and brought the snorkeling gear out of the car. Kristen is not much of a snorkeler (she gets very nervous), but we always carry snorkeling gear for her, just in case. I got into the crystal clear waters of Shoal bay and headed toward a rocky area not far from shore, where I hoped to see some marine life. To my surprise, I saw many beautiful fish in all kinds of colors and shapes. I even saw a baby shark, but never stopped to wonder where his mama was. To my bigger surprise, I suddenly saw Kristen getting into the water with her snorkeling gear on! Seeing Kristen snorkel showed me how relaxed and happy she was. Anguilla had won her over. I never told her about the baby shark, though. That was a little secret between Anguilla and me. Like everywhere we had been in Anguilla, we wanted to stay in the warm waters of Shoal bay for a little longer. We knew it was getting late and we had a date with Meads bay to watch the sunset, so we got into our car and headed back West. Upon our arrival, the pink sands of Meads bay looked magical under the fading light of the setting sun. There were a few clouds on the horizon, which just added to the astonishing beauty of the Anguillian sunset. The steel blue colors of the ocean along with the multiple shades of orange, pink and gray of the sunset showing through the clouds, filled both of us with an overwhelming feeling of gratitude, peace and deep joy. There, in sight of such display of pure beauty put forth by our Creator, Kristen and I decided to renew our vows. No witnesses in sight. Just us. My dream had finally come true. Dinner at Straw Hat was just as superb as it was during my first visit to Anguilla. The soft candlelight on our table, the moisture that permeated the air, the moonlight in the sky along with the delicious food and wine were an intoxicating combination that elevated our senses to a previously unknown level of pleasure. We struck casual conversation with a group of nice people that were in Anguilla on holiday and they shared similar feelings. Later, Kristen and I would comment on how happy everybody seems to be here. Everyone, local or tourist, exudes joy and a genuine feeling of contentment. Anguilla does that to you. It liberates your soul, allowing it to shine on those around you. Unfortunately, our day in Anguilla was coming to an end. Slowly and somewhat carelessly, we packed our luggage. I did not shake my clothes before placing them in the suitcase in hopes that some Anguilla sand would travel with me everywhere I went. Reluctant to go to bed just then, we stepped out to the beach and sat on a couple of chairs that we placed right on the water's edge. We looked at the starry night while the waves gently massaged our feet, which we could clearly see through the water thanks to the splendid moonlight. On the horizon, the lights of bustling St. Martin were a reminder of the world outside of this serene paradise. With nobody around, but the occasional tiny crab, we rejoiced peacefully on the bay trying to absorb as much of Anguilla as we could store in our hearts. That night, we left the door to our veranda wide open. The sea waves serenaded us and a gentle breeze kissed us good night. We fell asleep with a mix of feelings. We were sad about leaving, but at the same time we felt happy and fortunate for having had the opportunity to visit this heavenly place. My last thought before I finally fell asleep was a heart-warming one. I believe that when people go to heaven, their heaven will be exactly as they imagined it to be. 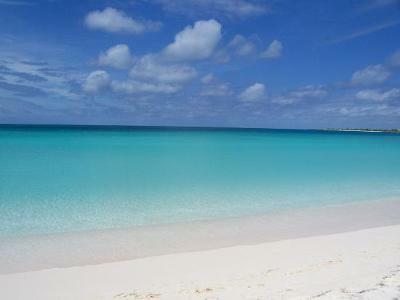 Therefore, in the after life, my Kristen and I will be in Anguilla again! With love to Anguilla and its wonderful People. Congratulations Ricardo, our "Your Dream Day in Anguilla" contest winner! 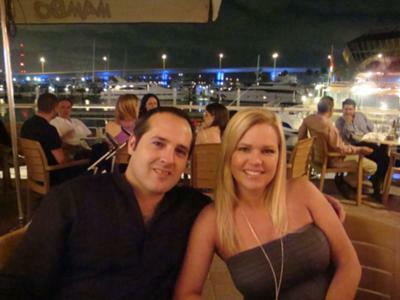 Click here to congratulate Ricardo on his winning, at his entry at its Facebook announcement.